Plenty of tourist attractions have their own gift shops, but how many gift shops have their own tourist attractions? In 1962, ‘Trader’ Frank and Jo Byars opened a small gardens on about four acres adjacent to their Signal House gift shop on Gulf Boulevard in Indian Rocks Beach. When the gift shop burned down in 1963 they rebuilt the shop and opened an expanded gardens in 1964. 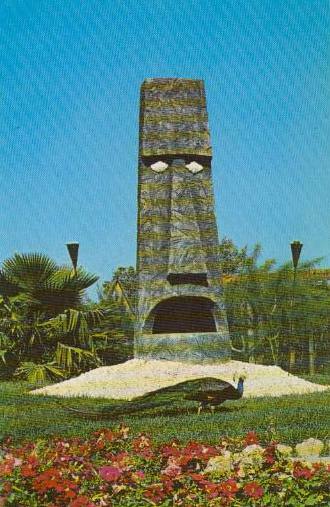 Eventually, following a 1969 expansion, the complex would encompass several gift shops, the south seas themed gardens complete with exotic birds and monkeys, and Trader Frank's Restaurant, on more than twelve acres. In 1986, the Byars sold Tiki Gardens to a pair of foreign investors who ultimately seemed unsure what to do with the attraction. They sold it to Pinellas County in 1990. The buildings were demolished and tikis sold, with much of the property being turned into a not so exotic beach access parking lot. Postcard image from the author's collection.